The Complete Works of Edgar Allan Poe is on the iPod Touch of the young library patron in the photo. How to create more scenes like this one? That’s much of what the LibraryCity site is about—helping public libraries thrive in the digital era and serve all of us, not just the economic and cultural elites. Click here to find out who’s behind LibraryCity. And if you want an e-mail subscription or a Kindle file of a specific post, we can oblige. Same for ePub files or printable, mailable, or savable files in PDF format. The buttons are on each post. Go here for a few more tips. 1. Adequate funding and modernization of local public libraries as well as K-12 school libraries. We need to reinvent brick-and-mortar public libraries, not use digital technology to eliminate them. LibraryCity recognizes the current usefulness of paper books for public library patrons such as mothers reading to toddlers, as well as the countless other people for whom digital technology is not at present a complete solution. Many e-books are not economically available to libraries due to publishers’ policies. Also, we believe that public libraries should retain their prominence as helpers of people in need, through reference services and otherwise. They should promote literacy in every form and for every age, as well as self-improvement in general. In addition, public libraries should be sources of recreation for young people and others and provide story-telling hours and other local programming. Also, they should encourage local empowerment, civic participation, local preservation and culture, and socially useful personal and business connections. In fact, as observed by R. David Lankes, an information science professor at the University of Syracuse, they should be more about connections between people than between books—one reason for LibraryCity’s advocacy of UsBook as a noncommercial alternative to Facebook. We also advocate such innovations as cell phone book clubs. Digital capabilities can not only help public libraries better serve their traditional roles but also help them serve society in new ways such as the creation of a national reference service through which a public digital system could augment the valuable local services. Local libraries should originate digital content and help patrons take advantage of cost-effective national collections. Public libraries should address such access-related issues as local WiFi, digital literacy, and the availability of e-reading hardware. In addition, they should strive to foster local creativity through means ranging from writers’ and artists’ groups online and offline to—in appropriate locations—3D printing clubs. Up-to-date public libraries are not only valuable as libraries but also as local economic drivers in numbero9us respects, and K-12 school libraries similarly contribute to prosperity by paving the way for a better-educated, better-paid workforce. Both kinds of libraries can be anti-poverty fighters in disguise. LibraryCity also supports more generous funding of libraries for higher education (especially those at community colleges) and research, but the very most dire needs tend to be those of public and K-12 libraries. We recognize the need for major urban public systems to serve in part as research institutions, not just public libraries for the masses. However, we believe that tax support of public libraries will suffer they if confuse their upper-level research functions with those most needed and in fact demanded by typical patrons. 2. The creation of a national digital library endowment as a partial funding solution. Per capita, U.S. public libraries were spending only about $4.20 per year on books and other content as of 2010, according to the Institute of Museum and Library Services (scroll down to the original Page 70 in this PDF). That’s the price of a slightly upscale hamburger. Many academic libraries also have had to cut back. While the U.S. needs copyright reform, all the copyright changes in the world cannot end one of the major challenges of America’s public libraries—only $1.3 billion a year for content as of 2010. The $1.3 billion is the cost of just one Defense Department office complex in Northern Virginia. No military or foreign policy judgments here. We are simply illustrating how pathetically our libraries now stack up against other priorities. Ironically our own military could suffer in the end—from less than fully prepared recruits without all the reading skills, reasoning abilities and curiosity needed in the field in the Internet era. The availability of a rich variety of e-books via home connections, including titles meant for recreational reading, could especially benefit the disadvantaged as long as good teachers and librarians were around to help them discover, absorb, and enjoy the books and other content. The national digital library endowment could not only help pay for digital content for public and academic libraries, but also help meet other needs, such as for school librarians. Do not count right now on the Gates Foundation. Just a speck of its fortune these days goes for public libraries compared to other praiseworthy causes such as malaria prevention in developing countries, and the foundation is phasing out its global libraries initiative. Besides, while bigger library donations from Bill Gates would be wonderful, should these civic institutions rely so heavily on just one man and his circle? Ideally Gates will encourage the creation of the endowment, to which he and other billionaires, including some signers of his Giving Pledge, could donate while serving as valued advisors. 3. Two separate but tightly intertwined digital systems, one public, one academic. The two systems could share a common catalog for optional use, along with an abundance of shared content as well as a joint technical-services and infrastructure organization and overlapping board members. Access to both systems would be universal. With a discrete public system, not just “one big tent” dominated by powerful academic institutions, ordinary Americans would be better served, especially in areas such as K-12 and family literary. Parents are children’s favorite role models, and we need popular-level books and others for both generations (and grandparents, too). The Douglas County system in Colorado, source of the video, teems with innovations that could be picked up by many other localities with help from a digital public system and the national digital library endowment. At the same time, without the distractions of the “big tent” approach, the academic system could better focus on specialized, upper-level content. Furthermore, with two systems, we would benefit from a wider diversity of content—particularly with state and local library systems controlling the public-library side at the national level. We prefer that the endowment and the public-library and academic systems be public organizations for optimal responsiveness and transparency, even though they could be developed originally as nonprofits to allow for maximum experimentation without bureaucratic obstacles. 4. The creation of UsBook or UsNet, a Facebook alternative that would be more user-friendly. Facebook’s experimentation with intrusive video commercials is an example of the direction in which this profit-driven social network is headed. One bonus of a librarian-run network would be that posts would be reliably preserved and links would be stable. At the same time users would enjoy more privacy and control over their content. UsBook would organically create material useful to future historians and other researchers of various kinds, including genealogists. Furthermore, UsBook—or whatever it was called—could tie in with a truly universal annotations system controlled by librarians. 5. Making digital libraries and e-books in general more accessible for people with disabilities, including a growing number of aging baby-boomers. We love assistive technology such as VoiceDream Reader (no vendor ties) and want products like the Kindle Paperwhite to be more useful to the print-challenged. 6. Preservation of both content and context. A national digital library system should not just link to resources but also strive to store them reliably at the system level and provide stable links for e-books, especially the networked variety. Writers and publishers interested in permanence could piggyback on these resources. 7. The continued spread of the nonproprietary ePub standard—which Amazon has downplayed in favor of its own proprietary standards. Librarians are sick, sick, sick of having to cope with different formats and also with proprietary DRM. 8. Cultivation of synergies between libraries and both physical and digital bookstores, which, for example, can benefit from “buy” links from library catalogs. In addition, libraries could provide “book lockers,” where patrons could safely store their digital purchases, in case vendors went out of business. The result would be more confident purchases of e-books. We are noncommercial and, to avoid paperwork, do not accept donations. Tom Peters is a veteran academic librarian, a long-time advocate of public libraries, and former director of the Center for Library Initiatives of the Committee on Institutional Cooperation, as well as a “Mover and Shaker” honoree in Library Journal. Formerly a digital strategist at Illinois State, he is now dean of university library services at Missouri State. For years, Tom has been interested in accessibility issues of the kind the LibraryCity site discusses. He holds a B.A. (with honors) from Grinnell College, where he majored in English and philosophy, and he earned an MLIS at the University of Iowa. David Rothman founded and publishes TeleRead, believed to be the oldest English-language site devoted to general news and views on e-books, including library uses. He is a former poverty-beat reporter and has written on the national digital library cause for publications ranging from TheAtlantic.com to the Chronicle of Higher Education and the Chronicle Of Philanthropy. As a writer, he is a copyright holder, but he is well-known in the e-book world for his advocacy of less restrictive copyright law. David believes in balanced copyright. For time reasons—Tom has been snowed under with work-related matters and is not presently involved in day-to-day operation of this site, although he hopes to share commentaries when time allows—David is the primary contributor. Like David, Tom believes in the need for separate public and academic digital systems. In fact, it was he who sensitized David to the importance of this issue. Jim Duncan, a 2011 LJ Mover and Shaker, has a focused mission: promote strategies for next-generation library and IT services while representing libraries as intrepid digital pioneers. Read Jim’s series on the national digital library issue, as well as essays he coauthored with David for Library Journal and Education Week, where they called for a national digital library endowment. He can be found on LinkedIn (jamesmduncan) or Twitter (@duncanjlib). Jim is executive director of the Colorado Library Consortium and earlier worked as director of networking and resource sharing for the Colorado Library. He has also been an academic librarian at the University of Iowa, Thomas Jefferson University, and the Balch Institute for Ethnic Studies. Corilee Christou is a library evangelist and director of library and publisher relations for LibraryCity. President of C2Consulting, Corilee holds an MLS from the Simmons School of Library and Information Science and has worked as a public, K-12 and academic librarian. She is well versed on rights licensing of digital content, having dealt with those issues as a vice president at Reed Information, which at the time owned Publishers Weekly, Library Journal and School Library Journal. Notice the excerpts from PW reviews when you shop at Amazon? Corilee helped put that deal together. She also worked as senior director, strategic relations, at Lexis-Nexis. In addition to consulting on digital rights licensing, Corilee is a columnist for Information Today, one of the most respected publications in the information industry. But never mind the formal titles. Corilee is a grandmother who regularly reads to her book-loving granddaughter, and through her work for LibraryCity, she wants to encourage family literacy in the digital era. Bertel King, Jr. composes and shares a new short story on bertelking.com every two weeks and is on Twitter as @bertelking. He is the author of Painting Thoughts, a self-published SF/fantasy novel he originally wrote as a high school student in rural Virginia (available DRM-free in the Kindle and Nook formats). A William & Mary graduate, Bertel now makes a living as a freelance writer and appears on various sites across the Web. Currently, he’s an active contributor to Android Police and Make Tech Easier. An interview with him appears here, and you can read his recently posted thoughts on cell phone book clubs here. He and his wife live in Richmond, Virginia. Paul has lived and worked in Asia and Central Europe, and currently divides his time between Hungary and other hangouts worldwide. His acclaimed first poetry collection, The Golden Age, was published in 1997, and reissued on Kindle in 2013, and his second poetry collection, The Musical Box of Wonders, was published in 2011. His co-translations from the Japanese include Nip the Buds, Shoot the Kids (1995) by the 1994 Nobel Prize-winner Kenzaburo Oe, and he has co-produced award-winning short films. 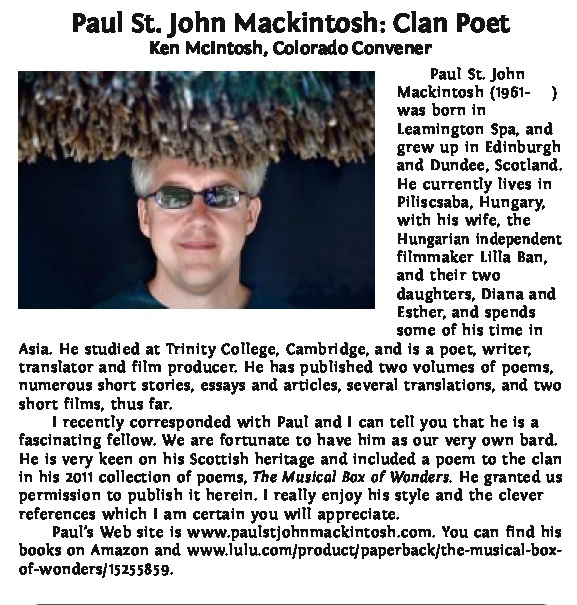 He is also an official clan poet of Clan Mackintosh. Opinions of LibraryCity contributors are their own and not necessarily ours, and vice versa. Likewise the views here do not necessarily represent those of any organizations with which Tom, David, Jim, Corilee, Bertel, Paul or anyone else is affiliated. LibraryCity contact information: [email protected] and 703.370.6540. Photo credit: The shot of the young Poe-reader is Creative Commons-licensed and is from the Unquiet Library (not associated with LibraryCity). Tell me, who pays for LibraryCity? Hi, Alan. Thanks for your question. LibraryCity is voluntary and self-funded. Modest Web hosting costs are about the only expenses. No stealthy motives. I’m simply a former poverty beat reporter for the Lorain (Ohio) Journal who didn’t exactly notice a surfeit of Dickens and Shakespeare in the homes of welfare mothers. Needless to say, we’ll welcome the participation of like-minded people. Jim Duncan, executive director of the Colorado Library Consortium, is among our contributors, as indicated above.